Today was a big day for Microsoft. They officially released Windows 8/RT and Windows Server 2012 to manufacturing and as expected, the final build number is 9200. The OS launches to the general public on October 26, which is also the same day you can get your hands on a Windows Surface tablet. I can’t wait to try one out. As with this announcement, the Windows Store is also open for submission of paid applications. 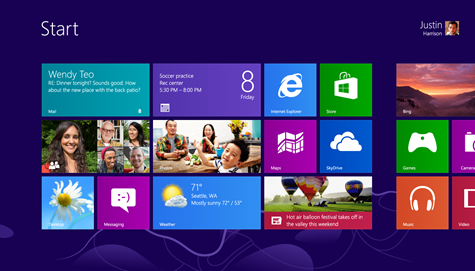 If you’re a developer, then you will be able to get Windows 8 from your MSDN or TechNet subscription starting on August 15. You can either upgrade for $39.99 (US) or with a purchase of a new PC. If you happen to buy a new PC from now until January with Windows 7, you will have the opportunity to upgrade to Windows 8 Pro for $14.99 (US). I’m looking forward to trying the final version of Windows 8. Microsoft is set to release two Surface-branded tablets that is will sell as competition to the Apple’s iPad. The Surface-branded tablets will be based on Windows 8 and Windows RT. They will also feature an integrated keyboard cover and a kickstand. See below for a sample screenshot. Also notice the new Microsoft logo.